Bowdoinham Historical Society has purchased the Merrymeeting Grange 258 building. Our goal is to preserve it as an important part of Bowdoinham’s historic village, as Merrymeeting Hall: A Community Center for Bowdoinham. Thanks to all who contributed to this cause. Because of your generosity ($70,000+) we now have a strong foundation which will keep the building stable for the next 100 years! It has also provided a useful ground floor space. Progress is Good! We have added heat, and are working on upgrading plumbing and electrical systems and improving ADA access. Fallen plaster in the theater has been removed and disposed of, with drywall to go up soon. A group is working on the future certified kitchen. However, our insurance company has requested that we replace by June 30, 2019 the west (church) side of the roof which is made up of old asphalt shingles, most badly curled. The roof is not leaking, but as the inspector pointed out, all our work inside is in jeopardy if it should start to leak. We NEED TO RAISE $10,000 to pay for the new roof and help with plumbing and electrical expenses. PLEASE CONSIDER DONATING TO THIS COMMUNITY-ENHANCING PROJECT, especially if you have not done so already. Please make a donation to help preserve Merrymeeting Hall. Use the Donate button at the bottom of the page to make a donation with a credit card or PayPal, or Donate on Facebook. 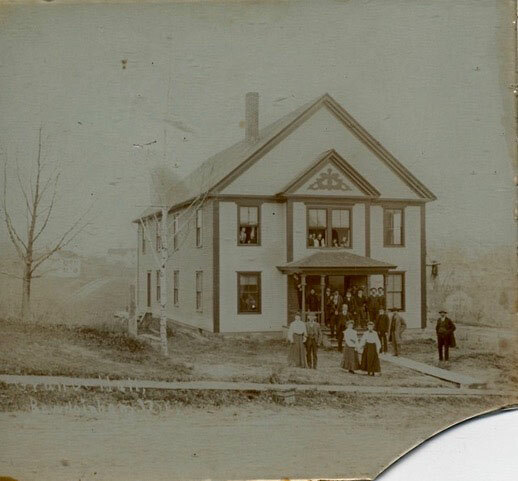 Photo: Merrymeeting Grange, c. 1910. Lancaster-Bishop Room: Third Floor Coombs Municipal Building. Tuesdays 10-12 & 2-5. We have great conversations, and we even get some work done making Bowdoinham history accessible to all. Everyone Welcome! The Carriage Shed is finished and proving very useful. Three cheers for all your support! Jellerson School: Step Back in Time ... We welcome classes or home school groups to experience a school day in 1910. Details here. See the Membership page for details on how to join BHS, or renew your membership online.